At Motion For Life, we believe in an integrated approach to your animal's well-being. Because every animal is unique, we offer customized treatment plans that fit the needs of the individual client. At each appointment, the therapist will evaluate your animal in its entirety. She will evaluate your animal's standing posture and gait. She will also perform a hands-on evaluation to check for areas of inflammation, pain, or restriction. These areas will be included in your animal's treatment plan. Customarily, the therapist who evaluates your animal will recommend an initial "package" of three appointments. * These three appointments will allow us to thoroughly address your animal's issues, open areas of restricted tissue, release tension, and develop an understanding of how your animal is going to respond to treatment. We can then recommend an individualized treatment plan going forward for your animal. Myofascial release therapy - This is the specialized massage therapy technique that is the focal point of our treatment. Traditional massage has many benefits; however, it affects changes only to the elastin portion of the tissue. Without affecting the collagen component, the results are more limited, and are often short-term. Muscle resetting- Often times, muscle and tissue that has been chronically unhealthy will have a tendency to want to continue in this familiar pattern. Proper therapy will guide the body to a new and healthy "homeostasis." *Motion For Life Integrated Animal Services often offers a specially-discounted "starter package" rate for your initial three appointments. Please call for current pricing. Emotional and/or behavioral resetting - An animal's expectation of pain, discomfort, or restriction can also play a significant role in an animal's dysfunction. An equally important part of the treatment program is to integrate the newly-restored physical body with the animal's current emotional expectations. "Rebounding" and mobility awareness - Rebounding is a gentle way to bring motion and movement into the body, and to begin to erode away restrictions, unhealthy tissue, and bracing patterns, by working beneath the body's "radar" Often - and especially in cases of chronic dysfunction- the physical limitations or restrictions may be resolved, but this new mobility has yet to be integrated into the body. Mobility awareness is the process or integrating this new-found movement into the physical and psychological awareness of the animal. In addition to the above-listed therapies, Motion For Life Integrated Animal Services strongly believes in a team approach. 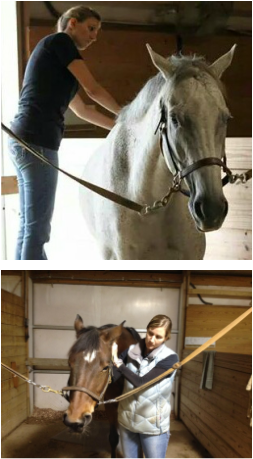 We work in conjunction with veterinarians, chiropractors, specialized dentists, and therapeutic farriers to ensure the best and most well-rounded care for your animal. We are happy to provide referral information at your request.